Manual dip picking of planar geological features from an image occurs on a flat surface, such as a computer screen or even paper. 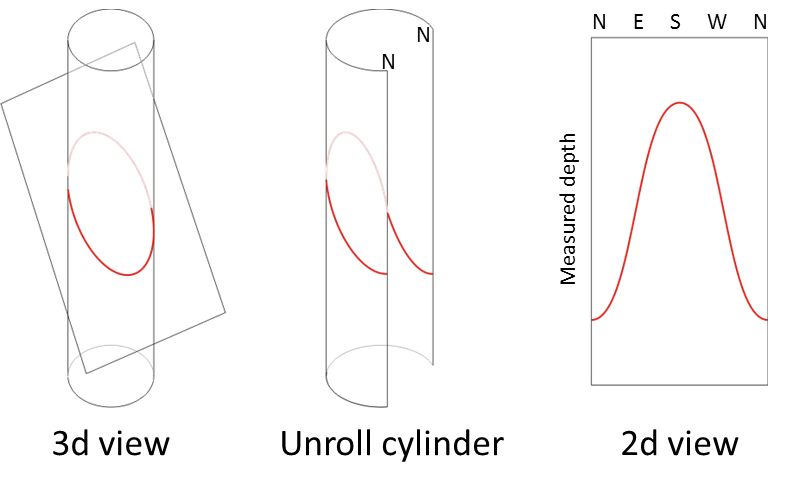 This involves un-rolling a cylinder (an image of the borehole wall) to a flat plane. Planar features that cut the cylinder, such as bedding surfaces and fractures, are changed under this transformation to “sine” waves that run across the flat-lying image. It is these sine waves that are picked during manual interpretation of an image. The intersection of planes with solid cones gives the classic conic sections of Greek geometry with all their mathematical richness; we geologists make do with the sine function.